When I first started investing in the stockmarket I was extremely naive. The first thing I did was a search for the share funds that had given the highest return over the past few years. 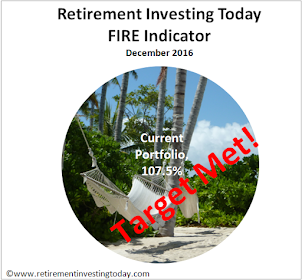 (What is it they say as a warning on many investments – past performance is not necessarily a guide to future performance or similar – I really was naive). Of course that was an actively managed fund. 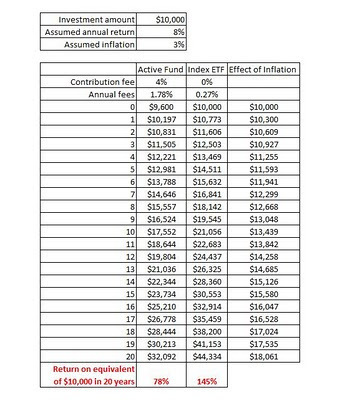 I have now changed my opinion and where possible only buy passive index tracking investments in my retirement investing low charge portfolio in vehicles like Exchange Traded Funds (ETF’s). I won’t go into the justification for passive versus active in this post today as there is plenty of information out there on the web already. A Google search of ‘passive versus active investing’ or ‘Bogle investing’ would be a good start for those that are interested. Instead what I am going to talk about today is the fact that in my excitement to snap up this great performing fund I ignored the fees the fund was charging and the potential long term effect that fees can have on your total return. 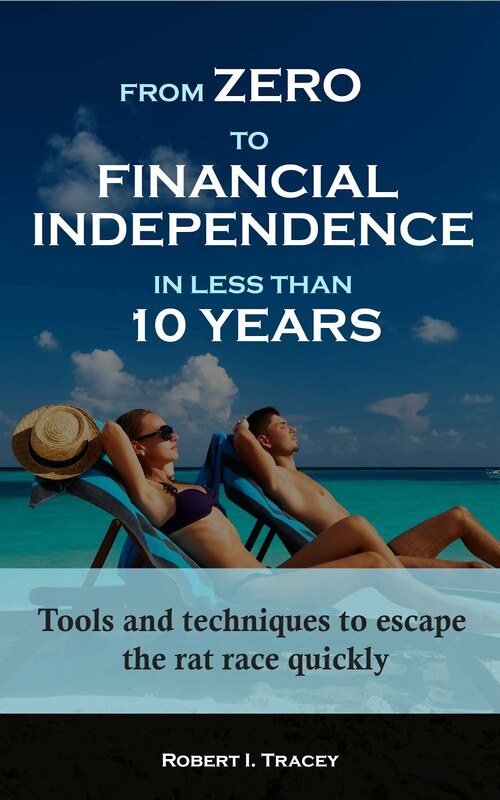 The active fund that I first purchased had annual fees of 1.78%. However that’s not all. In addition whatever money you invested also had 4% removed before it even made it into the fund in the form of a contribution fee. The only piece of luck (yes it was luck not good management) I had was that I bought through a provider that refunded my contribution fee however I still had the 1.78% annual fee to contend with. It however gets worse. This fund seemed to be performing well and so I bought myself an actively managed leverage share fund. This one had annual fees of 3.22%. Obviously this fee was justified because of the superior skill of the fund manager [sic]. When I came to my senses and sold this fund I achieved $5.30 per unit in 2007. As I write this post to buy into that fund today the unit cost is $1.66. That could have really hurt. As an aside I no longer have any leveraged my investments but that’s for another day. - I’m going to assume that the passive and active share funds will achieve the same market return. My readings make me happy to make this assumption however once you’ve finished your reading please feel free to disagree. I’m going to assume that the return these share funds return is 8% per annum. - I’m going to assume that inflation is 3% per annum. - I‘m going to use passive fees of 0.27% and active fees of 1.78% along with the active fund contribution fee of 4%. Now I’m going to invest $10,000 and then mix in the miracle of compound interest for a 20 year investment period. The results are shown in my table today. The results are really quite surprising. Firstly you need $18,061 just to have the same buying power as your $10,000 originally had. This is the effect inflation can have on your savings. 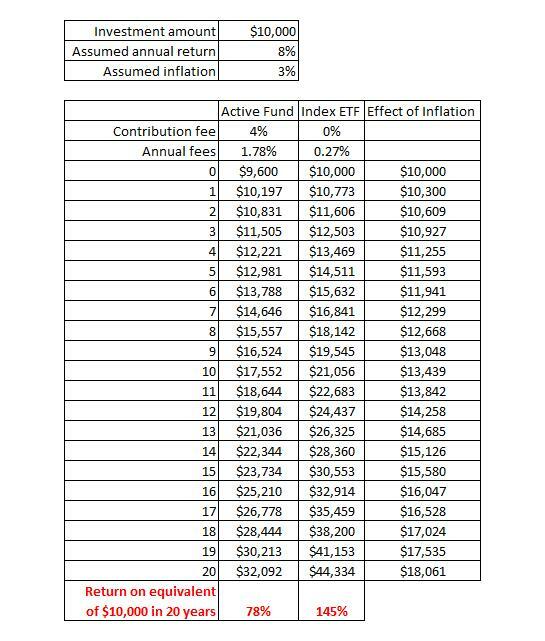 Your active fund has compounded up to $32,092, which is 78% more than the $18,061 needed to just hold purchasing parity against inflation. In stark contrast though, your passive fund has compounded up to $44,334, which is 145% more. That gives you nearly twice the return once you’ve considered inflation. That in my opinion is a significant difference and is the reason why I now do everything I can to minimise fees when investing. A final note I also work hard to minimise taxes as well. "Where are the customer's yachts?" springs to mind! It's a very difficult thing for the first time investor to get their head around I think. You look at the fees and say "hey it's only 2% a year" or whatever, and the fund's 10 year returns blow the market away, etc etc. I managed to do the reverse to the norm by starting out with indexing in the late 90's and then switched to actively managed funds when the bear market started in 2001 (switching funds when you under-perform is another 'great' retail investor tactic and worthy of a post by someone). This echos alot of what is said in Tim Hale's book, and is the philosophy that I subscribe to. In addition, most high-perfoming active funds rarely continue to perform highly over the long term, so in reality, the gap between your examples could well be even wider. by the way, I have noticed you don't have any sort of property widget on your site. I recently came across these widgets by Zoopla, I think they might enhance the functionality of your website (the cool thing is that they are free). It was that book title (amongst other things) that inspired me to go it alone back in 2007. Since then I've worked hard to get my total fees down to around 0.6%. Unfortunately I think that's still high compared to what's possible for investors in the US for example. Unfortunately 'rip of Britain' including 'rip off' occupational pension schemes mean that even over time I'm not going to be able to do a lot better than that. Agreed. Time Hale's book certainly covers most of this. Lots of other examples online also as I mentioned in the post. As an aside what did your average annual fees end up being after you pulled your database together?